(Bloomberg) -- Israeli speakers are scheduled to attend a conference in Bahrain for the first time next month, a reflection of improving relations between Israel and Gulf Arab governments with which it has no official ties. Four Israelis appear on the list of speakers for the three-day Global Entrepreneurship Congress to be held in Bahrain in the middle of April, according to the event’s website. Bahrain’s the latest Gulf Arab country to begin informally relaxing restrictions on its dealings with Israelis even though a peace deal with the Palestinians remains elusive. The move triggered a backlash among some members of Bahrain’s parliament. The lower house of the assembly, known as the Council of Representatives, responded on its Facebook page that the event’s organizers “have the right to extend direct invitations to any country and we can’t interfere.” The government said it didn’t directly invite attendees from a number of countries, including Israel, Qatar and Iran. Israeli Economy Minister Eli Cohen was quoted in November as saying he’d received an invitation without mentioning whether he planned to attend. The invite was sent by the Manama government and relayed to Israel by Swiss officials, Reuters reported at the time. Cohen appeared on an earlier official list of attendees but was later removed. The only Arab states to recognize Israel are Egypt and Jordan, neighbors with whom it has hard-won peace agreements. But ties with the Gulf have been warming in recent years, primarily due to a shared distrust of Iran and the lure of Israeli technology and weaponry. U.S. President Donald Trump has promoted this rapprochement, seeing Saudi Arabia and other Arab allies as critical to his policy of confronting Iran and advancing the Middle East peace proposal he’s promised to deliver soon. Israeli Prime Minister Benjamin Netanyahu has stepped up his campaign to normalize relations with Arab and Muslim-majority states. In October, he visited Oman. The same month, at least two Israeli ministers attended conferences in neighboring United Arab Emirates, and Israeli officials have hinted that there was more to come. 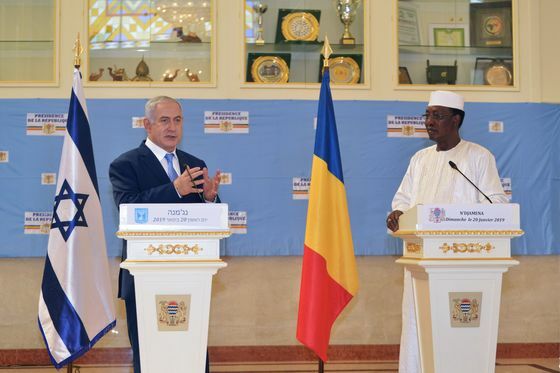 Netanyahu visited Chad in January and the two countries restored diplomatic ties. The changing tone was reflected in comments made last week by Anwar Gargash, U.A.E minister of state for foreign affairs, who said there would be more contact between Israel and “various Arab countries.” He also cast doubt over whether the Palestinians would ever have their own state. Arab countries fought Israel’s establishment in 1948 and have shunned it at the United Nations in support of the displaced and stateless Palestinians. While ties with Arab governments are beginning to develop, Israel remains deeply unpopular among ordinary citizens who support the Palestinian cause.